Add blooming style to community atmospheres with Module Series Aluminum Planters. 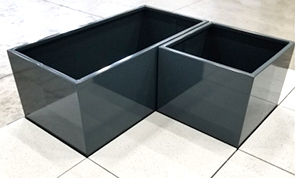 Built for durability and aesthetics, these commercial grade aluminum square and rectangular planter boxes are perfect for standalone or grouped arrangements both indoors and outdoors. Available in striking powder-coated finish options to collaborate with unique facility aesthetics. Optional manufacture applied custom drainage holes are available as well as small and large footpads to accommodate various installation needs. Planters are available standard without drainage hole, Manufacture Applied Custom Drainage Holes are available for an upcharge. If you have any questions, please feel free to contact us and we'll be happy to work with you to ensure the drainage hole meets requirements precisely.